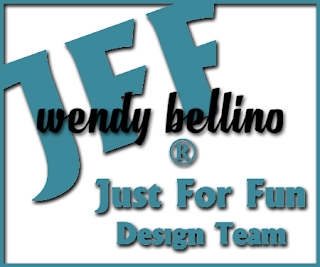 Just For Fun Rubber Stamps: Welcome HOME! I am ready for the spring pollen season to be over so that I can paint my front door. The pollen is everywhere! I haven't hung anything on my front door because it would be covered with pollen in minutes. In the meantime, I've been pinning on Pinterest for some fun spring door decor ideas. Today's card is inspired by some of the spring door wreaths I've been admiring! I used two stamps to create my card, the Bunch of Petunias and the Stamptangle Dragonfly. 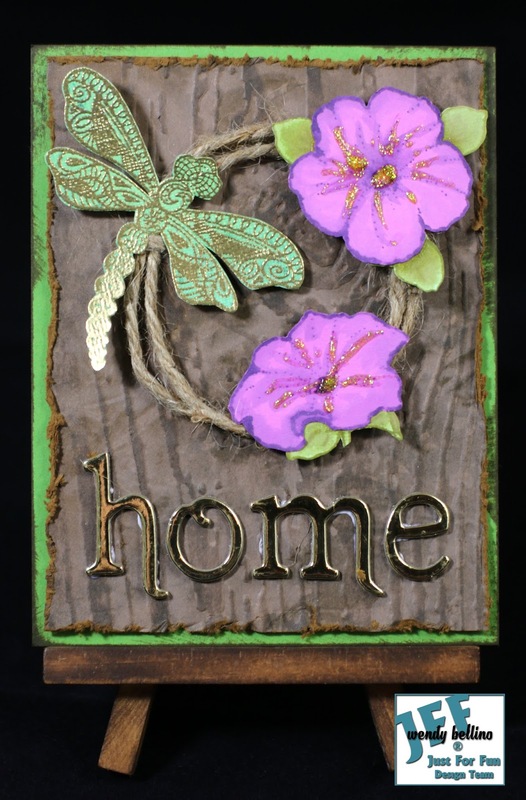 I heat embossed the dragonfly and trimmed along with some of the petunias and leaves. I pieced the petunias together and attached everything to my faux grapevine wreath. I found some font stickers in my stash and attached everything to a piece of card stock that I embossed with a wood grain embossing folder. Now, that looks like welcome home! The April JFF challenge has begun and the theme is Spring Flowers. 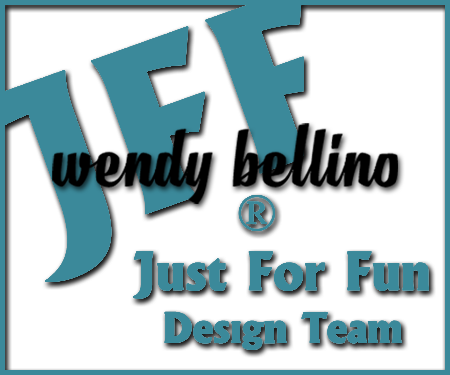 Link up your spring floral creation for a chance to shop at jffstamps.com. I'll look for you in the gallery! This is really neat, Wendy. Pollen is really bad here too. Great job! What a clever way to use those stamps! Very cool card! I hope the pollen clears up quickly! We are just starting allergy season here.